Charming Southern bed and breakfast retreats, practical business hotels and places to take the family pet – use this guide to choose the top 10 hotels in Atlanta. Georgia's oldest city offers a slice of the Old South, and visitors flock to the area to enjoy the rich Civil War history and to admire the Regency and Gothic Revival architecture. It's also becoming a popular area for arts and culture, with a fascinating array of galleries and museums, as well as a busy performing arts scene with theater and live music that rivals many of the surrounding cities. Atlanta's modern downtown is crowded with gleaming office towers, luxury hotels and world-class museums. But an Atlanta city break is also an opportunity to explore this city's historical and cultural roots. Book an Atlanta hotel and discover this city's southern charms. When the sun goes down, a different side of Atlanta comes out to play. Comedy and live music venues spring into life across the city, while craft brewers pull the pints. Then there are the huge nightclubs, drawing a glamorous crowd that's always suited, booted and ready to party. Bursting with attractions from hands-on museums to hair-raising roller coasters, Atlanta is ideal for a family city break. Will you dive with dolphins or stir up secret drinks recipes? Anything is possible here. Plus, there are numerous family restaurants to keep everyone's energy up. Boasting iconic sports venues and internationally-renowned performing arts centers, Atlanta is a city which shines on the world’s cultural stage. But Atlanta has also retained its Georgian heritage, with lush, Southern gardens and historic plantation houses providing just as much of a draw to visitors. The charming city of Savannah has an epic history spanning the Revolutionary and Civil Wars, and its heritage can be seen in its architecture and the museums where you can learn about the region's fascinating and sometimes turbulent past. The beauty and buzzing atmosphere of Georgia's oldest city attracts many artists and musicians, meaning there's a colorful cultural calendar, and visitors love the old markets and vintage boutiques where they can bag unique souvenirs. The city's love for the arts is reflected in the colorful and unique stores throughout Savannah, and you'll find plenty of locally owned galleries and boutiques where you can find a perfect souvenir to take home. The long and tumultuous history of Savannah also means it's a natural choice for antiques and vintage items, and you'll find lots of charming little shops where you can pick out something special. The oldest city in the proud state of Georgia, Savannah oozes classic Southern charm. It survived the Revolutionary and Civil Wars, as well as many titanic cultural changes, and its legacy can be felt everywhere you wander amid the Gothic, Greek Revival and Italianate architecture. Seeing grand homes owned by American heroes, and religious sites used by the early European settlers, you're bound to leave Savannah with a greater appreciation of American history. Soul food restaurants are at the heart of Savannah, and after a long day of exploring the historic Southern delights of this colorful city, there's nothing like sitting down in a cozy, friendly BBQ joint and enjoying the atmosphere. However, not all Deep South cuisine is about deep frying and high calories, and Savannah has its share of elegant establishments set in historic homes, complete with candlesticks and polite, attentive service. Of all the things that draw people to the bright lights of Atlanta, retail therapy is high on the list. From the funky fashions of Little Five Points to the luxe labels and sparkling gems of Buckhead, the city is a paradise of shopping choices. Whether you’re looking for the perfect accessory, a unique souvenir, or an extravagant gift, Georgia’s capital will have it in stock – and in more than one color. A short getaway in Atlanta allows just enough time to see the highlights. Follow this itinerary to make the best of two days and two nights in an Atlanta hotel. Whether you are looking for accommodation near the tourist sites of Downtown Atlanta or prefer to stay close to the shopping near the Perimeter Center, our guide offers something no matter what kind of traveller you may be. Atlanta is best known for its big-city trappings: high-speed expressways, gleaming high rises and efficient public transport. Look closely and you’ll discover plenty of places to enjoy outdoor Atlanta. Book your Atlanta hotel, then head off into the great outdoors. Striking the balance between sleek urbanity and bohemian cool, Atlanta is a city that’s confident in its own skin. Oases of green provide breathing spaces among the skyscrapers, while the arts districts dazzle with street performers and theaters. 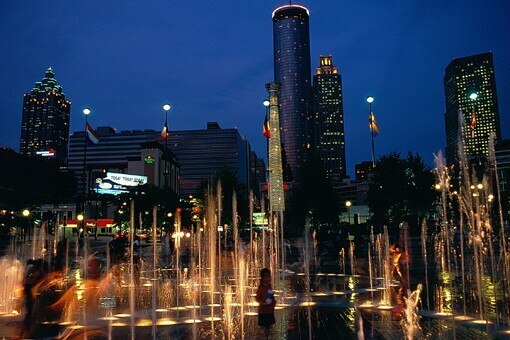 With world-class family attractions and an Olympic heritage, Atlanta will bowl you over.